Stride Tool is a privately held designer and manufacturer of innovative specialty tools and solutions for the professional technician. 1980 Founded in Ellicottville, New York, by Lori Northrup with a single automotive ignition-crimping tool acquired from an inventor. Over the next 15 years, various specialty tools were added through new product development and acquisition. 1995 Acquired Milbar Corporation, a Chagrin Falls, Ohio specialty tool manufacturer founded in 1956 by Ms. Northrup’s father, Jack Bares. The world’s leading manufacturer of safety wire twisters, Milbar tools have been designed and manufactured in northeast Ohio to exacting standards for over 60 years. 1995 Winner of Walmart’s single supplier Partner of the Year award, and featured in Walmart’s national “Made in America” TV commercials. We are a worldwide designer and manufacturer of specialty hand tools for the professional and DIY market…and developed into the worldwide leader of innovative products serving the HVAC/R service and tube working tool industries. 1996 Acquired Imperial Eastman’s tool and accessory division, located in Niles, Illinois. Founded in 1905 as the Imperial Brass Manufacturing Company and a pioneer in the manufacturing of brass valves and fittings, Imperial developed into the worldwide leader of innovative products serving the HVAC/R service and tube working tool industries. With strong worldwide brand name reputation and substantial international customers, Imperial is the flagship brand of Stride Tool, offerings solutions for the HVAC/R, electrical and automotive professional, in addition to industrial applications. 1998 Inc. Magazine 500 Fastest Growing Private Companies in America – #336. 2001 Milbar Division is recognized as a winner of Sears Partners in Progress award. 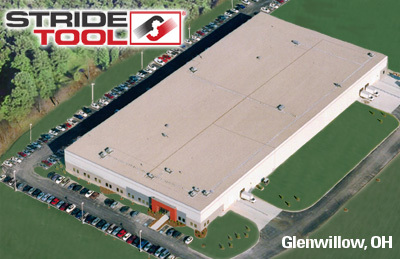 2004 Opened new corporate headquarters and centralized manufacturing facility in Glenwillow, Ohio. 2006 Ratcheting Mini Tube Cutter wins the Dealer Design Gold Award for excellence in the Tools category. 2012 Acquired Thermal Engineering Company of Mentor, Ohio, manufacturer of vacuum gauges, compressor tools, oil pumps, vacuum pumps, and other HVAC/R service accessories for over 40 years. 2013 Acquired Lakeland Products, Westlake, Ohio, a recognized leader in the fluid power tube fabricating industry for over 75 years. 2016 Stride Tool is purchased by CapitalSouth Growth Fund (CapitalSouthPartners.com), Medallion Capital, 4C Capital, LLC (4ccapitalllc.com), and former Stride Tool CEO Ron Ortiz. 2016 Acquired Bright Solutions International, Troy, Michigan, an industry leader in supplying fluid Leak Detection products.